The major landforms in Florida include the beaches, the rolling hills in the panhandle, the Everglades swamp and Lake Okeechobee. The Atlantic Ocean and the Gulf of Mexico surround the state. Even though there are 1,200 miles of coastline, only 700 miles are accessible beaches where vacationers and locals can enjoy their time. The rolling hills in the panhandle of Florida offer an inlet for boaters to access the Gulf of Mexico via the bays and inlets that separate the hills. 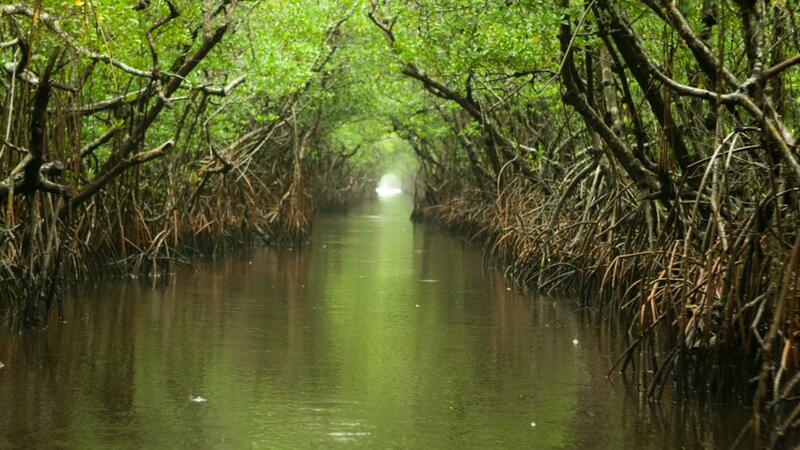 The Everglades are a subtropical wilderness. They are the largest swamplands in the United States. The Everglades are home to alligators and other types of subtropical wildlife. In addition to the Everglades, there are other swamplands around the state. Florida swamps include cypress domes, which are groupings of large cypress trees growing together to form a dome shape. Although Florida has over 30,000 lakes, Lake Okeechobee is the most famous inland landform. It spans 730 square miles, from the Florida Bay to the Kissimmee River. Even though the lake is the fourth largest in the United States, it is only 9 feet deep at its deepest point. Miami and the area south of Orlando obtain drinking water from this lake. Florida forms land boundaries with Alabama and Georgia, and is surrounded by the Straits of Florida, Gulf of Mexico and Atlantic Ocean, which is the state's lowest point. Situated on the Florida Panhandle, the state's highest point is Britton Hill with a summit of 345 feet. What Details Does a Reference Map of Florida Show? What Lakes in Florida Are Open to the Public? What County Is Venice, Florida, a Part Of? What Are Major Landforms of Louisiana?